The biases just keep rolling here as my father went to UMass Lowell for undergrad, back when it was called Lowell Tech. But I can assure you, that has no bearing here, especially because they didn’t even possess the same mascot back then as they do now. In all honesty, I have Northeastern and Lowell neck and neck here but the only reason I have the River Hawks one notch about the Huskies is because I think their home and away main offerings are that much better than Northeasterns. UMass Lowell’s third jersey? Please throw into an incinerator and never be heard from again. They’re so awful, I almost don’t want to address them. But I will, because I must. But before we get into that, let’s address the home and away mirror offerings UML trots out. The biggest reason behind Lowell’s high grade is because these badboys, when all together in a cluster, look really, really sharp…particularly the blue offerings. I’d prefer Lowell get rid of the two-pronged shoulder piping they have going on, because the Riverhawk logo is for horizontal spaces. With the striping so close together, it pinches that logo in tight, so I wish it was able to breathe on its own. I’m not going to take away too many points for that, though, because this beautiful color scheme is pronounced by a unique, bubbly wordmark front and center that offers no confusion as to who you’re dealing with. Most times, I don’t really like the one-color look in hockey, but the blue kit for Lowell really works for me. I’m glad UML did not opt for a red pants option here, I think it would really clutter up the look they have going. The white uniform is sharp, as well, and the blue pants act as a nice separator between top and bottom. Lowell, another program outfitted by Under Armour, has its brand represented well here, too. The grey alternates? What am I supposed to say? That logo is not intended to sit on a sweater all alone. That’s all I have to say about that. The silver / greyish color scheme, for whatever reason, just looks silly with all those other color accents. Leave this one in the spare closet for the 2017-18 season. It’s a good think you have some excellent home and away uniforms to rest your laurels on. I understand this one might create some controversy, but let’s remember, uniqueness of a uniform goes a long way in these rankings. I almost want to not consider the home and away uniforms and just focus on Robert Morris’s red get up, because those are the reason the Colonials weigh in so high at No. 19. Let’s briefly chat about the whites and blues. Eh. Nothing special. A not-so-attactive ‘RMU’ down the chest, but a unique and well-branded number font saves Bobby Mo a little face here. The star on the shoulder is a nice added element, as is the logo at the base of the collar. Aside from that, the whites and the blues aren’t really anything to write home about. The red uniform? That’s a different story. Incredible. These are amazing. There’s not other program in college hockey that embraces its long name and wrapped it around a number on the front of a jersey, and did so with prime execution. For some reason, I think white works very well on a red-based sweater, so I’m a big fan of the plain, white shoulder yokes. I enjoy the blue collar offsetting the white shoulder territory and how the white lace at the base of the neck emphasizes the white trimming theme throughout the uniform. I also find the heavily-accented striping at the bottom of the uniform aesthetically pleasing, offering even more of a unique look to an already one-of-a-kind sweater. The socks mock that pattern making Robert Morris’s red uniforms a keeper. 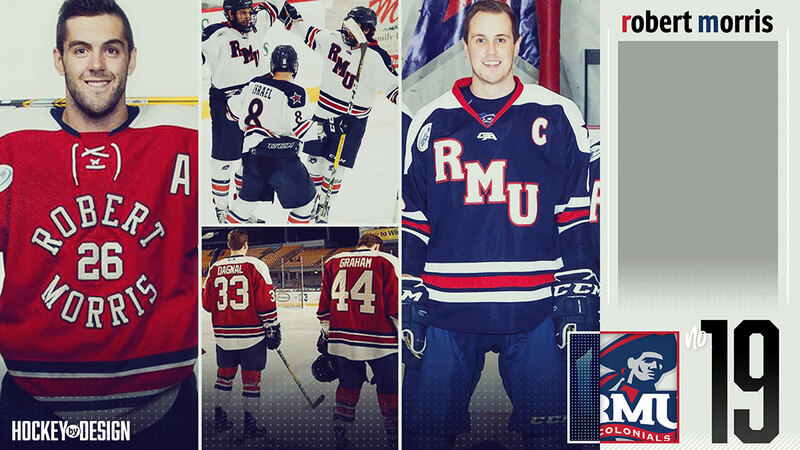 Take note, blue and white RMU uniforms. Providence has a unique set of offerings here that I wrestle back and forth with, wondering if the Friars should be higher than No. 18. They have a ton going well for them here, but I also think No. 17 is pretty respectable amongst the pantheon of classic getups we haven’t gotten to yet, so, the friendly Friars nestle in at the lower teens. In my humble opinion, it’s hard to screw up a black-and-white based uniform, and I think PC embraced its brand well in the hockey uniform aesthetic, as a whole. Let’s start with my favorite aspect of Providence hockey. 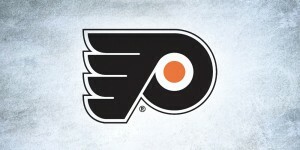 Find me a better logo that the skating Friar. You’d be hard pressed to. He’s pointy. He’s triangular. 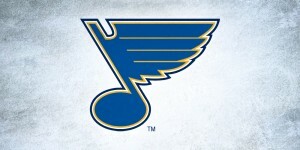 He’s as distinguishable a figure in all of sports logos, not just college hockey, as it gets. 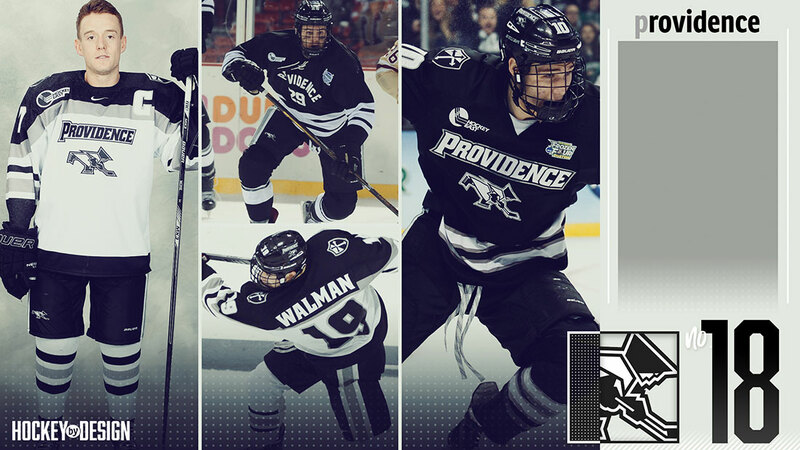 I’m obsessed with the skating Friar and appreciate the fact that PC has embraced that as a hockey-only logo. It’s one of the main reasons I have Providence up as high as I do. The other huge plus for me is these uniforms are not only very collegiate, much thanks to the skating Friar, but they’re branded extremely well and Nike did a fantastic job with these. They are only one of two Nike schools in Hockey East, and as we get higher in the rankings, you’re going to find I’m a biiiiiiiit of a Nike snob. I’m sorry. They do uniforms better than anyone. Bar none. It’s not even close. The one element of Providence’s uniforms I got back and forth with, on the white offering only, is that silver stripe that goes across the chest. It looks funny when you sew captains patches or league patches either on that stipe or close to it, but standing alone with just the swoosh above it? Hooo boy that’s sharp. I can also only think of one other program that’s embraced that look. 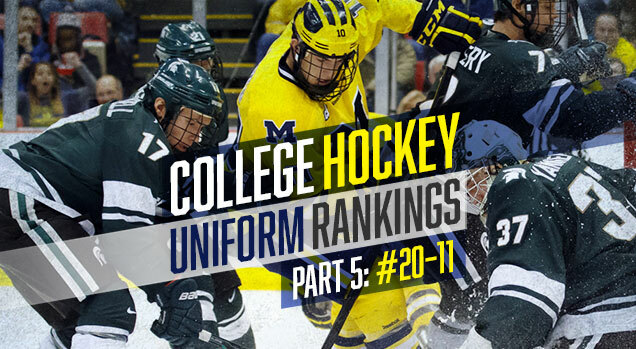 The black uniform on the right is just a solid, sturdy college hockey uniform. I love the bold, branded wordmark about out skating Friar buddy, it’s striped well. It’s just a sharp looking outfit. The name and number font on Providence’s uniforms fit what Nike has laid out for the Friars from a branding standpoint to a T. Everything falls in line with that look and it’s a unique look that Providence owns. The Frozen Fenway uniform PC wore (top, middle) was a cool looking throwback look, differing much from what they wear now. As a sucker for throwbacks, I enjoy these, but like their main home and away uniforms much better. A lot of college hockey uniforms have evolved over the course of time. 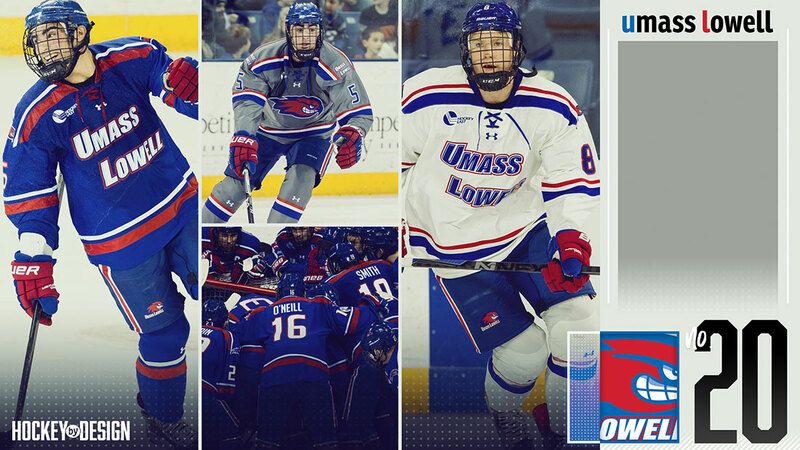 Teams like UMass Lowell or Providence come to mind as programs like those are starting to establish an identity. Colorado College is one of those programs that doesn’t have to do that. The Tigers of Colorado College could use a spool of hockey tape to slap that Tiger logo onto their pads without a sweater, and any college hockey loyalist will know who’s in town. The only problem with CC’s sweater is that it’s just that. It’s a classic college hockey look – one of the greats – but if one is knew to the game, they might not know what team they’re watching it the white or black kit is on the ice. 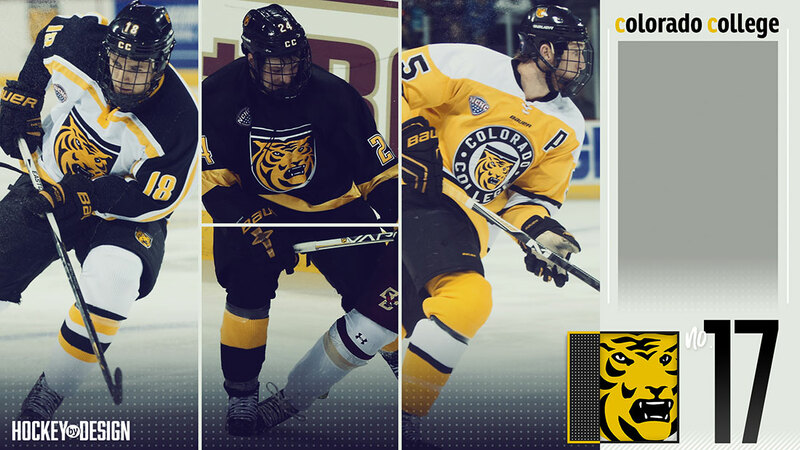 Let’s start with the most recognizable look: Colorado College’s black uniform. There’s not much to it, is there? There doesn’t need to be in my opinion. It’s essentially just a holder for the Tigers’ powerful, emblematic logo. If there were any more additions to it, I would be disappointed. I love that there isn’t anything on the shoulders and just small accents of golden yellow. I like the white uniform, just not nearly as much as the iconic black ones. I don’t care for the golden yellow piping all along the chest and the sleeve, but I also understand that these whites need some more accents than the black, just not as much as it has. I like the characteristic of the socks, just wish the yellow piping didn’t detract so uch from the main point of focus. I wish I like these yellow uniforms more, but I don’t. I’m not a fan of big circle markings on hockey jerseys for a variety of reasons, but mainly, I just think it’s kind of lazy. It’s not the right shape for a uniform and it’s technically the only major sport that really welcomes a fill circle as a placeholder for other text and markings. Just let CC wear the blacks all the time. That’s all they need and they’d probably prefer it that way! Let’s head deep in the woods of New Hampshire where we find one beautiful uniform, head to toe, one pretty decent looking uniform and one uniform that may induce vertigo and hopefully won’t be worn in 2017-18. Dartmouth’s white uniform is one of the purest college hockey has to offer. Two colors. A collegiate-looking font depicting the team name, perfectly sized and spaced. A legible number that compliments the crisp ‘Dartmouth’ up top and two simple, green lines at the bottom of the sweater and sleeve. The green shoulder yoke on these is just fine, topping off the classic, collegiate look and feel of these get ups. As was mentioned for Colorado College, the circle mark is a pet peeve of mine, but not when it’s on the shoulder patch. A circular ‘Dartmouth College’ marking going around the Big Green’s logo is a great compliment to wrap these white beauties up. The Big Green embraced their moniker with the all-green road kit. The fronts are essentially the same as the whites, which is my favorite part, but they two-pronged shoulder yoke is where I wish things were gone about a little differently, if not gotten rid of all together completely. Lastly, I’m a big fan of Dartmouth’s green helmet. The white ‘Dartmouth’ text on the bridge of the helmet is great with the white number just slightly above it is a very collegiate look. The ‘D’ on the side compliments those elements even more. 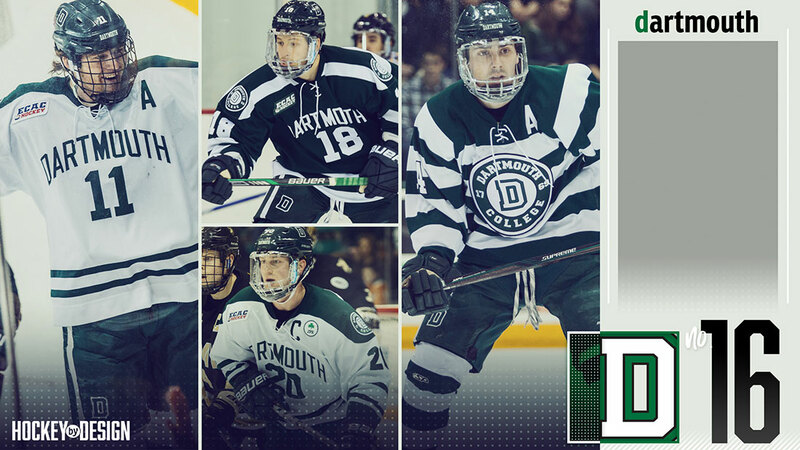 All in all, Dartmouth’s white uniform is the classic embodiment of good, old-fashioned Ivy League hockey and it’s hard to find something more collegiate than those. I also have these so high because my friend and counterpart at Dartmouth, Pat Salvas, said these had to be ranked high, so I’m sort of doing him a favor. Let’s be serious, Pat. These are like, No. 35, tops. Clarkson lands itself a nice little No. 15 ranking thanks to a well-executed color scheme a beautiful third, script uniform that should be taken into consideration for a white and a green getup. Let’s stay with the white and the green home and away uniforms. It’s nearly impossible to find anything that’s wrong with these. It’s also not the easiest to pinpoint what jumps out at you about them, either. To me, they embody a classic college hockey look: the three stripe piping system on the sleeve, bottom portion of the jersey and socks with a well-executed and stroked name and number on the front. It’s hard to shake a stick at that. There are subtle differences in the shoulders but all-in-all, possess the same framework as one another. The golden yellow threads are what have the Golden Knights so high on the list. The green script with a white stroke is executed brilliantly on the front while the ‘Golden Knights’ wording nestles in comfortably just below. The jersey number on the front is a nice addition because I don’t feel it detracts from the simplistic, script beauty that Clarkson is offering up here. These might be ranked a little high, but it’s hard to find anything wrong with them, so, as a whole, I feel as Clarkson did everything it could to earn its No. 15 spot! Everything about “the” Ohio State University makes me cringe. I have no shame in saying it. I hate Ohio State. There’s a reason for it, obviously. 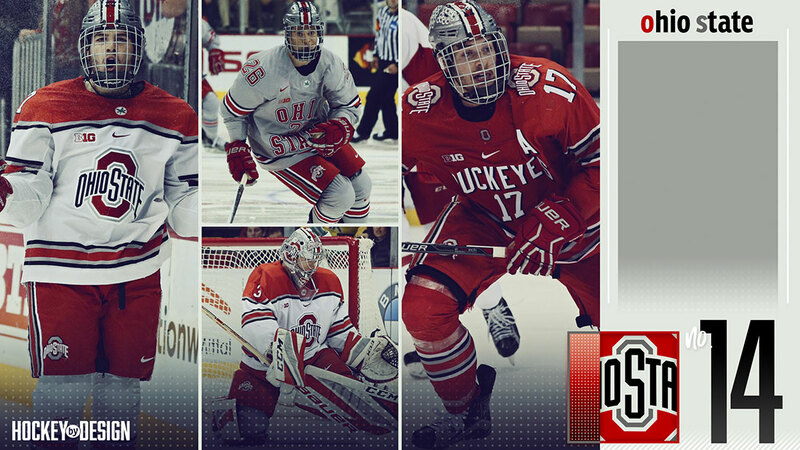 Unfortunately what I can’t say is that Ohio State’s hockey uniforms make me cringe, because they don’t. In fact, I think they’re incredible. I can’t believe I just said that. Let me go wash my mouth out with soap. We’re now getting into the thick of it here. 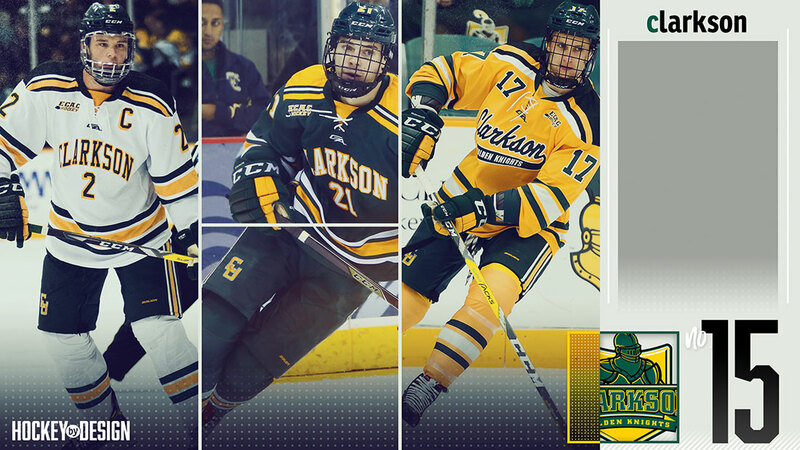 Big, powerful brand names, not just in college hockey, but all of athletics. Even though it pains me to say it, the Buckeyes are one of those brands. Ohio State offers up three distinctive looks, all of them pretty sharp in their own right. The home whites are the other uniform I was referring to in Providence’s review when it comes to the striping all the way across the chest. This was the model Nike used for thee two programs and I believe did so with many Olympic hockey jerseys the last time out, including the good ol’ U S of A. Main logo, front and center. It’s hard to confuse that one. Secondary buckeye leaf just below the collar is a great touch. The striping all throughout is strong and all together, OSU’s whites are a clean, well-branded look. The Bucks’ red offerings are an interesting one because I do like the piping on the sleeve, jersey and socks, but the Buckeyes font, including the number, are a little flimsy. I won’t nitpick too hard there, because the all-scarlet (what a terrible color) uniform does look sharp all as one. The logo and number on the shoulder, while albeit unique, is a bit busy, bit I’ll give the Bucks points for doing something different. The Ohio State ‘O’ at the base of the collar is strong, too. I go back and forth on Ohio State’s grey uniform. Sometimes I look at it and hate and other times I think, okay, that’s pretty decent. I like it because it’s unlike anything else you see out there. Big name, big number in the middle and an identifiable number only mark on the shoulder. Because it’s Ohio State, it works, but I don’t know how many other programs could pull this look off. Lastly, the Ohio State helmet pulls it all together, much to my chagrin. As much I despise it, the Ohio State football helmet, adorned with Buckeye stickers is as recognizable a symbol in college athletics than anything else. 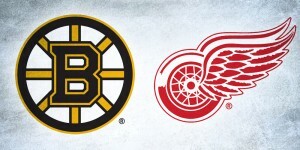 Anytime a hockey program can incorporate that established brand into it’s look, I’m all for it. Okay, can I stop saying nice things about Ohio State now? And forever? Did you really think a Michigan grad was going to let Ohio State receive a higher ranking than the maize and blue? Uhhhh, no. Not a chance in hell. But as I said before, this is an “unbiased” ranking and I do believe Michigan edges out Ohio State in the looks department. Let’s start where I left off with Ohio State. If you’re Michigan, and you’re wearing a helmet, it better damn well be the winged-tip helmet. Well, good news…it is. That alone, earns the maize and blue a ton of points because not only is it necessary, but it looks natural, too. U of M has four different offerings. We’ll start with the block ‘M’ kits in the white and maize. It’s hard to critique these from a branding standpoint. When you plop one of college athletics most recognizable marks front and center on your sweater, you’ve won. I actually like the whites more than the maize offerings here because I think it partners with the white jersey much cleaner. The block ‘M’ and the number on the shoulder without any other piping on the shoulders is a classic look for me, as well. Let’s shift our attention to the blue uniform. I wish we didn’t have to because I think that these are honesty pretty bad. I think the blocky, maize shoulder yoke looks clumsy and it’s worsened by tossing the block ‘M’ and number in that vicinity. I appreciate the plainness of the front, letting the name and number speak for itself, but, as a whole, I’m not crazy about these. My favorite uniform of the lot if Michigan’s throwback jersey, the maize sweater with the blue, stroke script font that’s front and center. 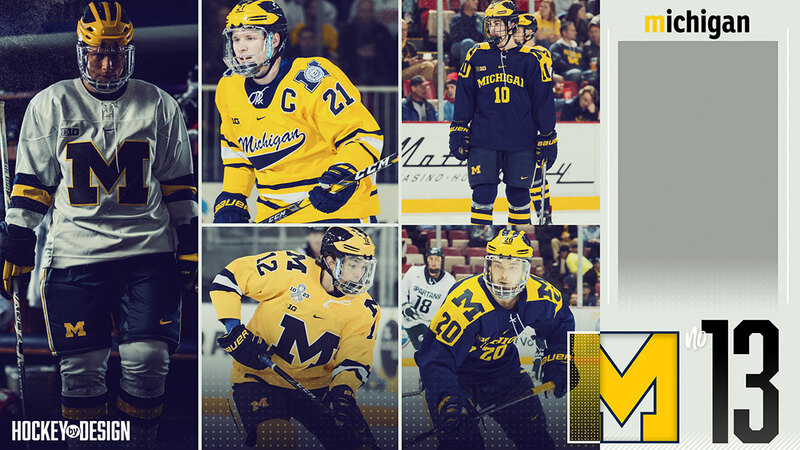 It harkens back to Michigan’s 1998 national championship club and it’s executed perfectly to a T, from the exact same script and old school university patch on the shoulder. The blue collar with white lace is a nice contrast to a loud (in a good way!) uniform. Michigan seems to use the same pants for all four uniforms, and I don’t think maize pants would work that well, so I’m glad the Wolverines keep is simple and consistent in that department. Hail to the Victors! There, I said it. Michigan, I love you, I really do, but Minnesota has a pretty strong outfit, top to bottom. Unlike Michigan’s blue uniform that I didn’t necessarily care for, the Golden Gophers have a strong array across the board. Minnesota also has four kits to choose from, three of essentially the same variety on a fantastic second white option. The Gophers bash you over the head with that classic, funky looking ‘M’ that Minnesotans hold near and dear to their hearts. There are many times I’m not in favor of slapping a logo that big on the front of the sweater, but this just looks too good to say other wise. It’s a perfectly-shaped ‘M’ for the front of a hockey sweater and one that has a pretty good amount of cache built up over the years. All three shoulders have unique characteristics about them, but they all have pretty much the same effect. The biggest difference in the three sweaters is that the gold jersey has the outline of Minnesota at the base of the collar, something that will always win you brownie points in my book. Out of the three, I think the gold top is the best, pairing well with the maroon pants, but all three are incredibly sharp and iconic. Minnesota’s other white version is one of the best offerings in the game. 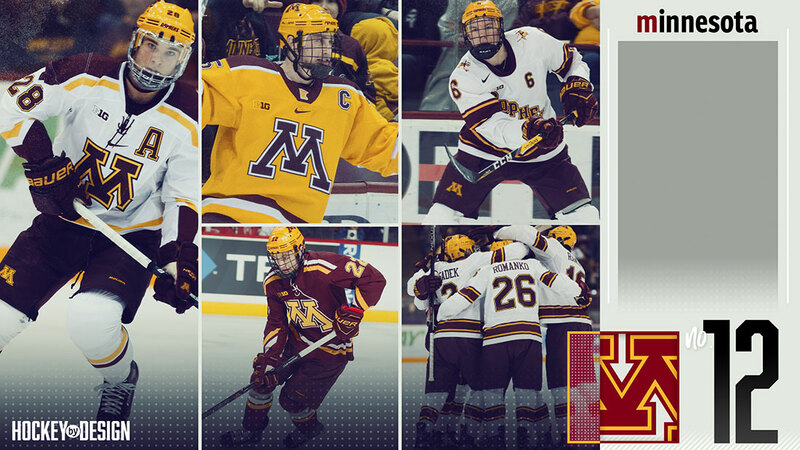 From the Gophers slanted wordmark to the jersey number flanking on the opposite side to one of the best hockey-only marks in the country, this uniform is scintillating. The old-school gopher playing hockey in the leather helmet as a secondary mark on the shoulder is one of my favorite logos in all of sports, let alone just college hockey. I know Minnesota’s women’s program adopted this logo for the front of one of their uniforms and it looks just incredible. The backs of the uniforms are clean, crisp and legible – it’s hard to ask for anything more out of them. Even the thick, two-colored stripe on the sleeve, jersey and socks are a thing of beauty. I’m going to get some hate on this one. That’s okay. You can make your own list if you want. Remember, don’t be mean! This is subjective and fun! Why do I have the Big Red just one spot outside the top 10 in the first-ever college hockey uniform rankings countdown? Because Cornell doesn’t need any fancy colors. The Big Red won’t have any shoulder yokes or silly, unnecessary lines bogging down their uniform. No sir-ee. 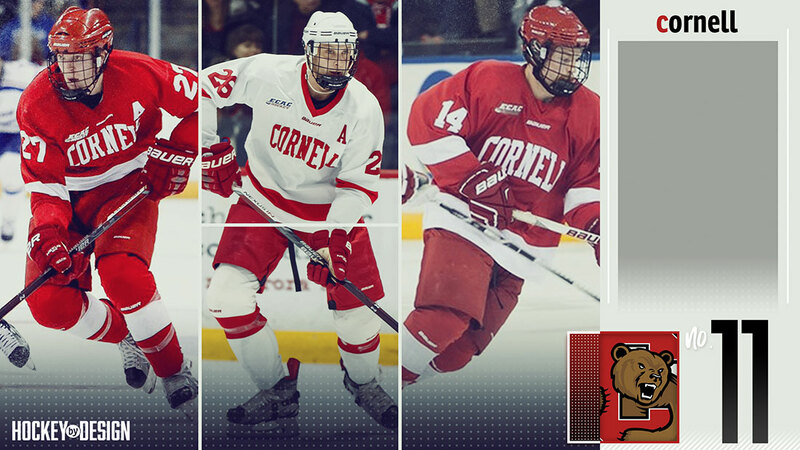 All Cornell needs is its team name. One thick stripe on each sleeve. And an one rim around the bottom, whether it’s the entire bottom of the jersey, like on the reds, or a red stroke on the whites, THIS my friends, THIS is the embodiment of a college hockey uniform. Is it exciting? No. It’s not. This is an Ivy League program with a pair of natty titles to its name in 1967 and 1970. It doesn’t need to be fancy. It had Ken Dryden between its pipes back in the day and I’m not going to defend my No. 11 choice any longer. They’re clean. They’re crisp. They’re college hockey. And that’s what this list is all about. Also, you have to tip your hat to a program that’s literally called the Big Red, but refers to it’s colors are carnelian and white. First off, any school that copies their University’s football uni is out. Half of the Big Ten…GONE!